By Rachel Held Evans, on November 12, 2013. Last week, you posed some excellent questions to Rabbi Rachel Barenblat as part of our ongoing "Ask a...." interview series, and Rabbi Rachel rose to the occasion with some really thoughtful and informative responses I'm thrilled to share with you today. Rabbi Rachel was ordained by ALEPH: the Alliance for Jewish Renewal in 2011. She holds an MFA from the Bennington Writing Seminars and is author of three book-length collections of poetry: 70 faces: Torah poems (Phoenicia Publishing, 2011), Waiting to Unfold (Phoenicia, 2013), and the forthcoming Open My Lips (Ben Yehuda, 2014), as well as several chapbooks of poetry. A 2012 Rabbis Without Borders Fellow, she participated in a 2009 retreat for Emerging Jewish and Muslim Religious Leaders in 2009, and in 2014 will serve as faculty for that retreat. Rachel serves Congregation Beth Israel, a small Reform-affiliated congregation in western Massachusetts, where she lives with her husband Ethan Zuckerman and their son. She blogs as The Velveteen Rabbi. We’ve already interviewed an Orthodox Jew. Since Rachel is a Jewish Renewal rabbi who serves a Reform congregation, she brings a different perspective. I hope you learn as much from this interview as I did! I think the assumptions which bug me tend to be about Judaism writ large, not about Jews as individuals. For instance: the assumption that the Christian understanding of covenant has superceded and obviated the Jewish one, or that Judaism isn't a legitimate path to God in its own right. That Jesus rendered Judaism moot or obsolete. That Judaism is a tradition of dry, unforgiving legalism while Christianity is a religion of love. That last one probably frustrates me the most, not only because it's been used to justify some real unpleasantness toward Jews over the last two thousand years, but also because it's so antithetical to my experience of Judaism. From Karl: Who do you feel you have more in common with, religiously - Christians who take a progressive/liberal theological approach to their faith similar to the way you approach Judaism, or Jews (conservative or Orthodox) who take a significantly more literal/conservative approach to the Jewish faith than you do? I have a different kind of common ground with progressive/liberal Christians (or Muslims or Buddhists or Hindus or members of other religious traditions) than I do with Jews on the very-conservative end of the religious spectrum. Progressive religious folks of all stripes tend to share a post-triumphalism (a sense that it's time to move beyond the old triumphalist paradigm in which one religion is The Right Path to God and all the other paths are wrong), as well as an inclination toward reading our sacred texts through interpretive lenses which take into account changing social mores and changing understandings of justice. We experience God and revelation as perennially-unfolding, which means there's always room for new ways of understanding divinity and sacred text, especially when the old ways of understanding them (e.g. antiquated readings of Leviticus 18:22) turn out to be hurtful or to seem misguided. My teacher Rabbi Zalman Schachter-Shalomi teaches that each religious tradition is an organ in the body of humanity. We need each one to be what it is and to bring its own unique gifts to the table. (If the heart tried to be the liver, the body would be in trouble.) But we also need each one to be in conversation with, connected with, the others. (If the heart stopped speaking to the liver, that would be a problem, too.) It's easier for me to connect with people of faith who share that kind of view -- who see all religious paths as legitimate paths to the One Who is beyond all of our imaginings -- than to connect with fundamentalists of any stripe. That said, over my years of learning in rabbinic school, I've come to feel a deeper connection with Jews of all denominations. I believe in the ideal of klal Yisrael, the Jewish community as one family -- even though some members of that extended family do challenge me in a lot of ways! There's certain ground which I have in common with all Jews, even if our ways of being Jewish are very different. From Keith: How do reformed Jewish clergy address the questions raised by the historicity of scripture? For example, the Exodus clearly plays a significant role in the scripture, yet no historical evidence exists that it actually happened. To me, the question of whether or not the Exodus "really happened" is kind of beside the point. What matters to me is the fact that we keep telling this story. The telling and re-telling of this story is central to Jewish peoplehood. The Exodus narrative -- that we were slaves to a Pharaoh in Egypt, and God brought us out of there with a mighty hand and an outstretched arm; that a mixed multitude left Egypt with us, which teaches us that freedom is not for us alone -- is central to Jewish identity. We retell this story each year during the Passover seder, of course, but there's more than that. We refer to it every day in our standard liturgy when we praise God Who redeems us from the narrow places which constrict our lives. (The Hebrew word מצרים/ Mitzrayim, usually rendered as "Egypt," can also be read as "The Narrow Place" or "The Place of Constriction.") We refer to the Exodus every Friday night when we bless wine; the kiddush prayer which we sing over wine speaks both of God's resting on the seventh day of creation, and of our obligation to remember the Exodus from Egypt. And we do this regardless of whether or not we think it's historical truth. Far more interesting, to me, than scripture's historicity (or lack thereof) is the way we interact with scripture devotionally, and what our continued attachment to this story can teach us. I've written on this subject before; my 2005 post, "Story and truth", is all about this question, and my 2008 post, "The historicity of revelation" may be relevant to your interests, too. The short version is: I don't think the Exodus did happen in historical time, but that doesn't at all detract from its powerful spiritual truth, or from the ways we've constituted our community through telling this story in the first person plural, and through embracing the teaching that the Exodus didn't just happen then but unfolds even now. Of course, I've just answered this question on a personal level and you asked about the views of Reform clergy in general. Here's one Reform answer: "Were the Jews Slaves in Egypt?" by S. David Sperling. But one of the principles of Reform Judaism is that revelation is a continuous process, which means that it's perfectly "kosher" for our understandings of scripture to continue evolving and changing -- and also means that it's incumbent on each of us to learn enough to determine how to understand this story for ourselves. From Hannah: I'm interested in reading about the Bible from a Jewish perspective but don't know where to start. I love the idea of Midrash, but the literature seems so vast and I feel overwhelmed. What would you recommend for a Christian who wants to try reading some Midrash? The first text I'd recommend is Bereshit Rabbah, which has been widely-translated into English. (I don't own this Jacob Neusner edition but I trust his work and I expect it's both solid and true to the original.) Bereshit is the first word in the Torah; it means "In the beginning" (or "as God was beginning" or "in a beginning"), and it's also the name we use for the book known in English as Genesis. Bereshit Rabbah is midrash arising out of the Book of Genesis, and it's full of fascinating stuff. I also recommend Hammer on the Rock, edited by Nahum Glazer, which is an anthology of short teachings from Midrash. And Barry Holtz's Back to the Sources: Reading the Classic Jewish Texts offers useful context, though it can be a bit dry at times. I put this question out to some of my Rabbis Without Borders colleagues, and in addition to seconding the Bereshit Rabbah idea, they recommended Searching for Meaning in Midrash: Lessons for Everyday Living by Michael Katz and Gershon Schwartz and Reading the Book: Making the Bible a Timeless Text by Rabbi Burt Visotzky. If you're interested in contemporary / feminist midrash, don't miss The Five Books of Miriam: A Woman's Commentary on the Torah, edited by Ellen Frankel, which offers creative contemporary womens' response to Torah. I also love Rabbi Jill Hammer's Sisters at Sinai: New Tales of Biblical Women; Rabbi Shefa Gold's Torah Journeys, which exemplifies her personal midrashic way of relating to Torah; and Alicia Ostriker's The Nakedness of the Fathers: Biblical Visions and Re-Visions. And let me mention as a meta-point: before you dive in, find someone who wants to study with you! The classical Jewish mode of study is never solitary; we learn in hevruta, which means a study-pair-of-friends. That way you can talk about what you're reading, and puzzle over it together. If there's something which confuses one of you, the other might see it clearly. Two minds really are better than one. And in the interplay between your two understandings arises the potential for learning a lot more -- and for deepening your relationship with each other and with God as you deepen your relationship with the text. Why am I talking about Talmud when you asked about Torah? In Jewish tradition, we frequently speak in terms of "Written Torah" (the text of the Hebrew Scriptures as they have come down to us) and "Oral Torah" (the ensuing centuries of conversations and interpretations of our sages and rabbis, which are also considered to be holy.) We always read Torah in the context of generations of commentators and interpreters, Rashi, Talmud, Midrash, all the way to new interpretations in the modern age. We also frequently speak in terms of finding four levels of meaning in Torah: the simple / surface meaning, the hinted-at or allegorical meaning, the midrashic meaning, and the deepest secrets of the text at its root. (The acronym for those four levels of interpretation, in Hebrew, is פרדס / Pardes, which means Paradise. Any time we delve deep into the meanings of Torah, we get a taste of paradise!) So when we encounter a commandment which is problematic or immoral to our modern sensibilities (like stoning a disobedient child), we have a lot of hermeneutical tools at our disposal. The God to Whom I relate doesn't command the stoning of a disobedient child (nor the other "texts of terror" in Torah.) So either we need to accept that those texts are mired in the moment when they were written down, or we need to find a new way to read them. My own belief is that Torah is a document written by human hands, which reflects the human sensibilities of those who wrote and codified it -- and that it is also a reflection of our encounter with God, both then and now. I see Torah as a mirror for our own spiritual development, a roadmap for our spiritual journey, a repository of our tradition's wisdom teachings. Jewish tradition holds that Torah has 70 faces, which tells me that Torah has many facets and can be understood in a variety of different ways -- indeed, it's that very richness and multiplicity which allows us to continue to experience it as holy. It's incumbent on us to find ways of reading it which are consonant with our most deeply-held morals and values. That is our obligation and our joy. As our sages say, "Turn it and turn it, for everything is in it." From Josh: Hi! I was wondering your thoughts on the eschatological views on Israel and the Middle East held by many Christian Evangelicals. How do they compare with your own views about the end times, and how it relates to present-day Israel/Palestine? Thanks for asking. I'm troubled by the Christian Evangelical understandings of Israel to which you refer. First and foremost, those understandings arise out of a theology that's incompatible with my own. What I mean by y'mei moshiach, "the days of the Messiah" or "the messianic age," is not the same as what Evangelical Christians mean by that. (Here's an excellent article about the Messianic Concept in Reform Judaism, which articulates a Reform Jewish understanding of what messiah / messianic age mean. There's emphasis on tikkun olam, healing the world, and on our partnership with God in bringing about the day when the work of perfecting creation is complete.) I'm also affiliated with the Jewish Renewal movement, and in Renewal, we frequently use Hasidic metaphors -- which in turn draw on kabbalistic metaphors -- of raising up the sparks of divinity in creation in order to heal creation's brokenness. Again: very different from the Evangelical sense of eschaton as I understand it. Instead, I'm invested in the work of continuing to create a strong and vibrant Jewish Diaspora as well as working for peace, justice, and harmony in the Middle East. From RHE: I'd love to hear more about Emerging Jewish and Muslim Leaders. What did you learn about interfaith dialog from that experience? What strategies for productive conversation around religious differences proved most effective from your perspective? I participated in a retreat for Emerging Jewish and Muslim Leaders when I was in rabbinic school, and it was amazing. (I wrote an essay about it which opens up some of what I found so meaningful and beautiful -- "Allah is the Light: Prayer in Ramadan and Elul.") A group of ten Jewish rabbinic students (from across the denominations) and a group of ten emerging Muslim leaders spent three days together on retreat. During that time, we studied the story of Joseph as it appears in both of our traditions -- in holy text (Torah and Qur'an) and in commentary (midrash and tafsir) -- and also learned a lot about each other. I'm looking really forward to helping to facilitate a similar retreat in 2014, this time just for women. Jews and Muslims have a tremendous amount in common, though that's often overlooked or ignored in both of our communities. Some of what I learned about interfaith dialogue: we need to speak to each other face to face. It's good to break bread together. We need to be ready to hear truths which may discomfit us. We need to be able to de-center our own experience in order to hear someone else's perspective wholly. There's a kind of sharing and intellectual / spiritual intimacy which is only possible after a few days of dining together, learning together, studying our sacred texts together. We frequently carry the same stereotypes about each other without knowing it. It's incumbent on all parties to try to recognize their own prejudices and assumptions, and to be willing to set them aside. We have more in common than we think. From Sarah: As a clergywoman in a Christian denomination, I wonder what your journey was like – were you always accepted because you were in Reform congregations, or were there still struggles over gender issues? I am delighted to be able to say that this was never an issue for me. The first woman rabbi was actually ordained in 1935, though no others followed her until some decades later. But the Reform movement has been ordaining women since 1972, and I grew up knowing that women could be rabbis if we wanted to. My teacher Reb Zalman ordained the first woman in Jewish Renewal in 1981 when he ordained Rabbi Lynn Gottlieb. (For more information: A History of Women's Ordination at the Jewish Virtual Library is decent, though a bit dated; it doesn't speak, for example, of happenings in the contemporary Orthodox world such as the ordination of women under the new title Maharat. For more on that, try the Forward's The Maharat Movement.) 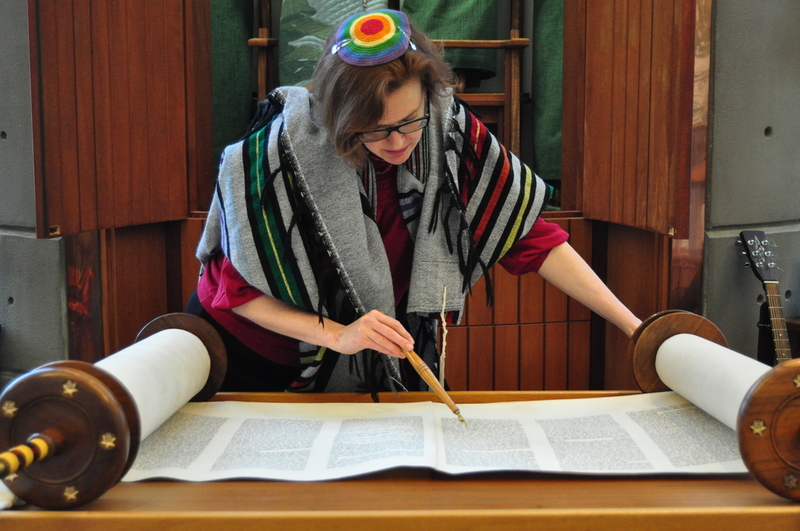 The Reform movement and the Jewish Renewal community have also been ordaining members of the GLBT community for many years. I'm humbled and honored to be part of this chain of learning and teaching. I hope these answers are helpful and satisfying. Thanks for inviting me! Check out the rest of our "Ask a..." series.